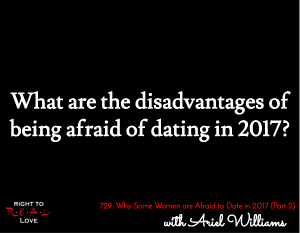 In this episode, Jay continues his discussion with Ariel Williams by addressing the question: What are the disadvantages of being afraid of dating in 2017? What are the disadvantages of being afraid of dating in 2017? The risks that come along with dating. How fear can hinder us from having great experiences. Why we don’t want fear to control our lives. The disadvantages of being afraid to date in 2017. The importance of facing our fears.